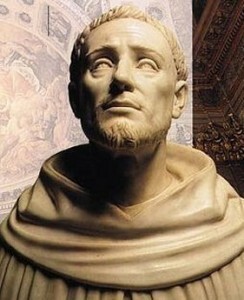 St. Dominic de Guzman was born in 1170 at Calaruega, Castile Spain. His parents were Felix and Jane of Aza who were of Spanish nobility. Although there is not much written about his father, his mother was born a Holy Woman and was beatified in 1828 by Pope Leo XII. She was a huge influence on the family, Dominic’s oldest brother, Antonio, became a secular priest, spending his life ministering to the sick. Their other brother, Manes, became a Friar and was beatified by Pope Gregory XVI. After completing university Dominic was ordained into the Catholic Priesthood at the age of 26. Bishop Don Diego chose St. Dominic to be his companion on a mission through Toulouse. Dominic’s mission was under the King of Castile. The King chose the Bishop and Dominic to go to the Lord of the Marches to oversee a Danish prince demand his daughter’s hand in marriage in exchange for the King’s son. On this mission through Toulouse, the Bishop and Dominic witnessed with amazement and sadness the work of spiritual ruin brought on by the Albigensian heresy. It was there he first had the idea of founding an Order that would combat heresy and spread the light of the Gospel. During this second mission the princess died, freeing them from the King. They then left for Rome. Bishop Diego decided to resign as a Bishop so he and Dominic could dedicate themselves to converting the non-believers. But Pope Innocent III refused to allow the Bishop to quit, and instead III sent the Bishop and Dominic to Languedoc, a former province of France (now continued in the modern-day regions of Languedoc-Roussillon and Midi-Pyrenees in southern France). There they met the Cistercians, who proved to be difficult to convert due to the monks’ indulgent habits. Still, Diego and Dominic helped these monks reform their lives, and it was because of those changes that Cistercians reformed their lives also. It’s been estimated that about 100,000 people converted due to Dominic’s preaching and miracles. With the permission of Foulques, Bishop of Toulouse, Dominic built a convent at Prouille in 1206. He began to provide a supply of trained virtuous preachers, who provided shelter for converted women, and provided girls’ education, and for a permanent house of prayer. The convent gave the nuns an opportunity to teach the children of Catholic Nobility, and Dominic gave rules and constitutions, which has since been guided by the nuns of the Second Order of Saint Dominic. During Lent of that year, St. Dominic preached in various churches in Rome, as well as before the pope and the papal court. It was during this time Dominic received the office of Master of the Sacred Palace, or what is more commonly known as the Pope’s Theologian. This office has been held only by members of the Dominican Order from the founder’s time until present. Dominic turned down many offers to become a Bishop, saying he would like to move around freely to help him teach and preach the gospel. Dominic spent the next years traveling Europe, setting up convents for women and orders in difficult places. He worked hard to help the impoverished and to convert non-believers. Dominic lived to serve God. He prayed and preached uninterruptedly from place to place. On August 6, 1231, at the age of 52, Dominic de Guzman died in Bologna in Brother Moneta’s bed because he did not have one of his own. He died in that poverty he often spoke to others about. St. Dominic was canonized on July 13, 1234, by Pope Gregory IX, three years following his death. Pope Gregory said that he no more doubted the sanctity of St. Dominic, than he did that of St. Peter and St. Paul. St. Dominic’s feast day is August 8.